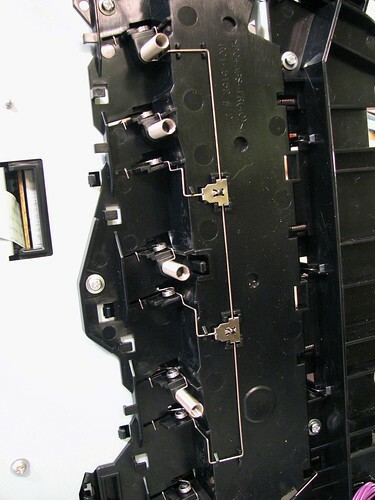 One of the interesting points about how this machine is made is that many of the individual springs that you used to find in things like this have been replaced by larger networks of springs– a move away from off-the-shelf parts to fully custom parts. I guess in this kind of volume, it’s actually cheaper. Part of a detailed photo essay about taking apart a modern color laser printer. Samsung’s mono laser printer and mono laser multi-function printer which feature the NFC function (M2022W/M2070FW Series) have been highly praised by renowned local reviewers in Europe such as Trusted Review and Stiftung Warentest. Trusted Review reviewed of Samsung’s M2022W mono laser printer as an ideal printer for everybody at affordable prices. The magazine also praised of its fast printing time through mobile devices and user-friendly interface and networks. Stiftung Warentest, a German review magazine, ranked Samsung’s M2070FW multi-function as the best product in the related category in its April issue. ?? NFC ???&??? ??? ???? ????? ?? ??? NFC(Near Field Communication) ??? ??? ?? ??? ???? ???? ?? ? ?? ?? ???? ??? ?? ???? ?? ????. ??? ??? ???? ???? ?? 8? ?? ???? ??? ?? ?? ??? ??? ‘M2022W’? ??? ‘M2070FW’ ???? IT ??? ? ?????? ??? ??? ??? ??? ??? ???? ??? ?? ??. ??? IT ??? ????? ?? (Trusted Reviews)? ?? ? 30? "?? ?? ??? ???’M2022W’? ???? ???? ????? ???? ???"?? ????. ??? ? ?? ?? ???? ?? ??? ?? ?? ???? ????? (Stiftung Warentest, STIWA)? ?? 4???? ?? ?? ??? ??? ‘M2070FW’? ?? ??? ??? ?? ? ?